Rubicon Heritage Services were recently commissioned to examine the magnificent Waterford Charter Roll, housed in the Waterford Museum of Treasures. 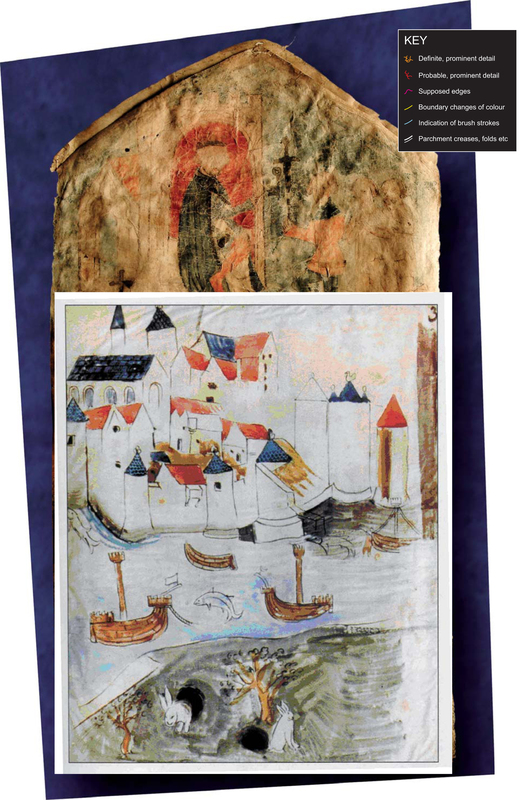 This faded document contains the earliest depiction of an Irish city, and it was the task of our graphics team to bring this image to life for the Cois tSiuire publication. This was the first time in 150 years that a detailed interpretation of the image had been attempted- Rubicon illustrator Sara Nylund describes the process for us. In the summer of 2010 Rubicon Heritage Services were asked by NRA Project Archaeologist James Eogan if our graphics team could attempt to create a reproduction of what the main scene from the Waterford Charter might have looked like in its heyday. This work was carried out for the Cois tSiuire monograph, dealing with the archaeological excavations on the N25 Waterford bypass that were funded by the National Roads Authority and Waterford County Council. 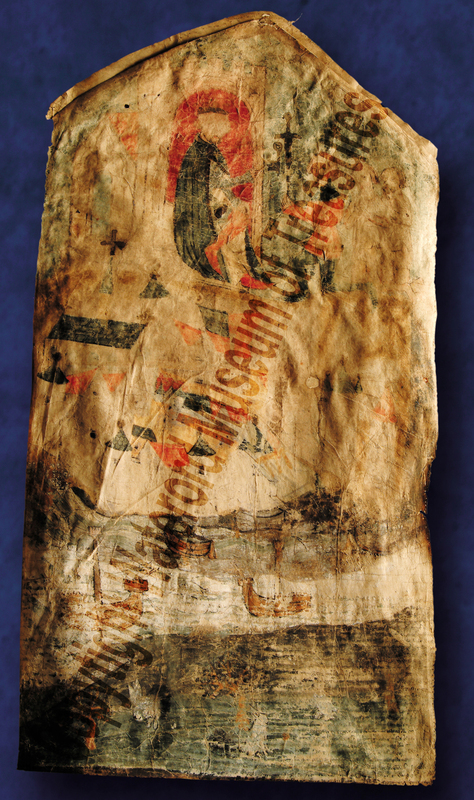 The faded depiction of the City of Waterford on the Waterford Charter Roll, dated to c.1372. Photograph by Terry Murphy, Copyright Waterford Museum of Treasures. The Waterford charter, or the Great Charter Roll, is dated to 1372 and is currently housed in the medieval gallery of Waterford Museum of Treasures. It was drawn up as a propaganda exercise by Waterford, most probably as a result of a long running dispute with New Ross over trade issues, in order to confirm charter status with then King Edward III. On the image the King is depicted at the top of the roll receiving the key of the city from the sheriff and two bailiffs. Underneath this scene the medieval City of Waterford is painted, depicting features such as Churches, Reginald’s tower, whitewashed walls and brightly coloured roofs, all meant to highlight the city affluence. This roll is unique in Ireland and is the earliest depiction of an Irish city. Our reproduction of the Great Roll image was based purely on a visual assessment of the charter, rather than any technological methods such as x-rays or infrared scanning. The process began with a comparison of the last major attempt to recreate this scene, a 19th century du Noyer drawing, with a modern photograph of the Charter. The two images were placed on top of each other in a digital format. Both versions were compared and the differences between the images were traced and recorded. It quickly became apparent that our approach revealed previously unseen details of the medieval image. The Rubicon graphics team then examined the Charter ‘in the flesh’ to see if further information could be gleaned, and compared this data with our knowledge of how the medieval city appeared in the 14th century. All the data collected from the field trip was brought back to the office and incorporated into the developing sketch. 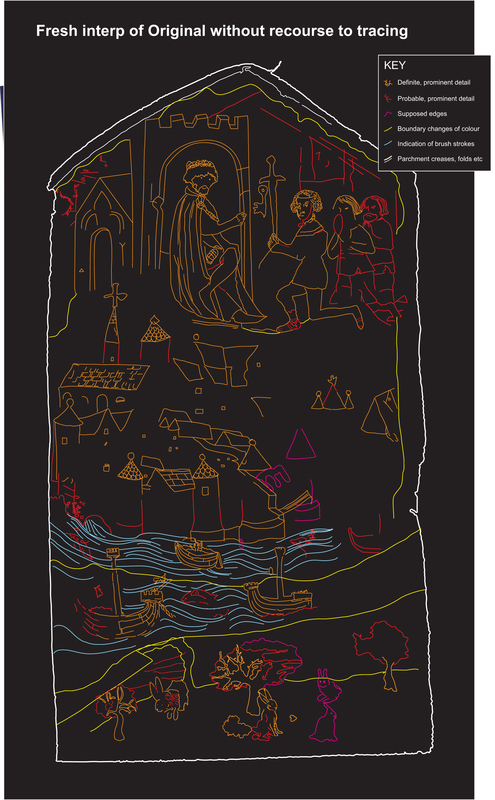 After a final layout was agreed on and all features of the map had been sketched in, the image was worked up digitally in a style aimed to mimic, rather than replicate, the charter scene. The image was finally submitted for review and sent to print, and it now graces the pages of the Cois tSiuire monograph. It is hoped the finished reconstruction breathes new life into what is a truly remarkable medieval image; it was certainly a great privilege for the Rubicon team to work with such a significant and important object. 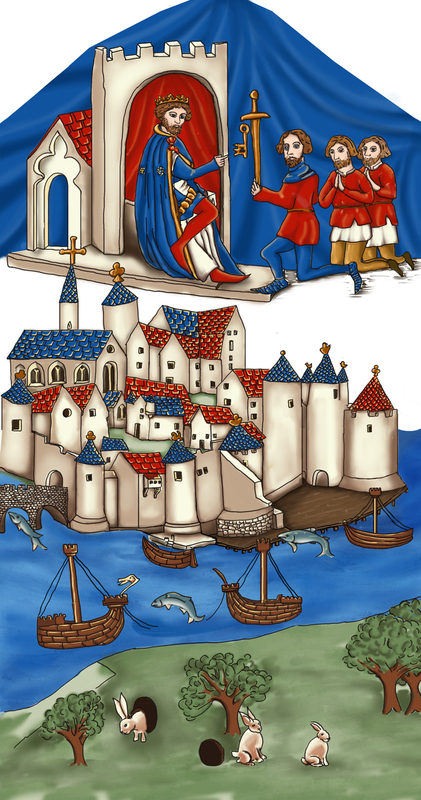 The final reproduction of the image of the City of Waterford, by Rubicon's Sara Nylund. Our work revealed important new detail including a previously unseen bridge, and additional wildlife. This entry was posted in Medieval Archaeology, Rubicon Heritage and tagged Archaeological Graphics, Archaeological Illustration, Archaeological Services, Archaeologists Cork, Archaeologists England, Archaeologists Scotland, Archaeologists Waterford. Bookmark the permalink. Great work by both artists – I’m amazed at what you achieve; it’s come alive again. Well done. Hi,Congrats and bet wishes for future finds,My observation is this,The 2 holes or borrows appear out of proportion to the picture,and I was wondering were these “borrows” ,Tunnells or cavev that gave access to the city.and were the rabbits in actual fact working mules,depicting the long ears?? ?just an outside observation.BB. Nice one and in fairness to the original and the De Noyer excellent perspective. @Bernard Birkett – rabbits were a huge delicacy back then having just been imported – by the Normans (each rabbit was the worth of a pig. To this day many areas are called a version of Coinegar reflecting the area where they were bred for ‘high table’) and the large holes might be there to show how safe it was to keep and breed such an exotic animal. Ther local museum in Dundalk had guns designed to look like walking sticks – for poaching rabbits right up to the 20th century.